If you're nuts about squirrels, this shirt is perfect for you! It's available for women in 9 different styles, including a maternity shirt. You can buy this shirt here. 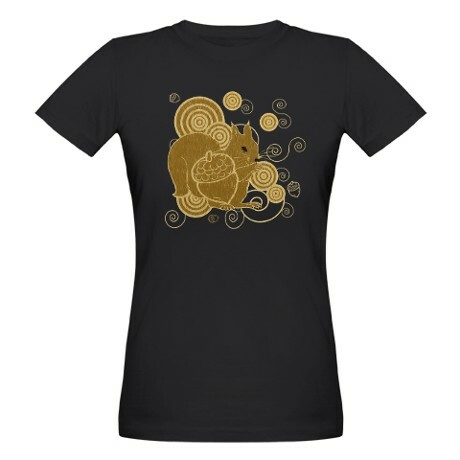 This is a cute two-tone squirrel drawing decorated with an acorn and elaborate spirals. It comes in nine styles for women, including a maternity shirt, women's v-neck (standard and plus size), and plus size scoop neck. It's nice to see an attractive design that's available for women of all shapes, sizes, and states. Although the squirrel occupies a large printed area, CafePress's printing technique embeds the ink in the shirt, so you never get that heavy, plastic-y feeling that older printed shirts had.